A horse's teeth change throughout its life and proper dental care is essential for your horse to be comfortable feeding, grazing and carrying a bit. But what types of problems can develop, and how should they be taken care of? Does Your Horse Have Tooth Problems? When a horse shows one or more of these symptoms, it may be necessary to consult a veterinarian or equine dentist for a proper diagnosis and treatment. The faster any dental problems are treated, the healthier your horse will be. Sharp Edges or Hooks: As teeth wear down unevenly, they may become sharp and can cause injuries to the horse's cheeks. This is a very common problem when horses don't eat enough roughage (which few horses do outside of a completely wild diet), and is easily solved by "floating" the teeth – filing them down to restore even, firm surfaces. For most horses, this needs to be done every 6-12 months to keep the teeth even. Wolf Teeth: These small, extra teeth can develop in a horse's jaw, and will crowd other teeth and cause discomfort and misalignment. They can also make it painful for the horse to carry the bit comfortably, which can lead to behavioral problems. If untended, these teeth can also develop cavities and rot, causing other health issues. If wolf teeth are a concern, they can be rounded or filed down, or they may be completely removed. Lost Teeth: Young horses will lose their first set of teeth as they mature, and senior horses will lose permanent teeth as they age. While this is a natural occurrence, it can lead to difficulties eating, and senior horses especially may have difficulty getting the proper nutrition. 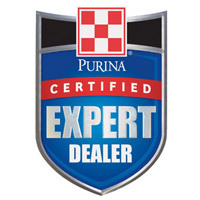 Adjusting a senior horse's diet to more soft foods can compensate for lost teeth, and it may be necessary to include high quality supplements or vitamins for nutritional balance. In addition to these typical problems, horses can also develop many other dental problems familiar to humans, such as plaque or tartar buildup, gingivitis, gum and periodontal disease, cracked teeth, abscesses and more. Being familiar with your horse's teeth and inspecting them periodically can help you discover any problems quickly, before they dramatically affect your horse's health. 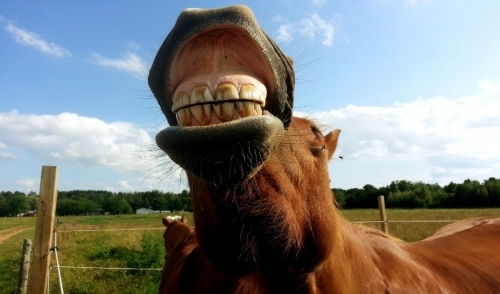 With the proper dental care, your horse will have strong, healthy teeth, and that's always worth smiling about.